THE SKINNY: After have varying degrees of success with several of the higher-end brands' hair oil treatments, L'Oreal's Mythic Oil Nourishing Oil was a real disappointment. Maybe the problem is in the ingredients. L'Oreal uses avocado and grape seed oil to provide shine and frizz protection. My favorites use argan oil. My favorites also leave my hair feeling healthy, bouncy and bright. Mythic Oil left my hair flat and dull. And both those attributes got worse as the day went on. Thank goodness I tested it during a lazy Sunday at home. This works just like other oil products. Put a few drops in your palm and work into damp hair. Style as usual. I though the oil looked a little white and cloudy compared to other brands. KEEP OR TOSS: Toss. I just can't do that to my hair. Stick with Orofluido Beauty Elixir instead. 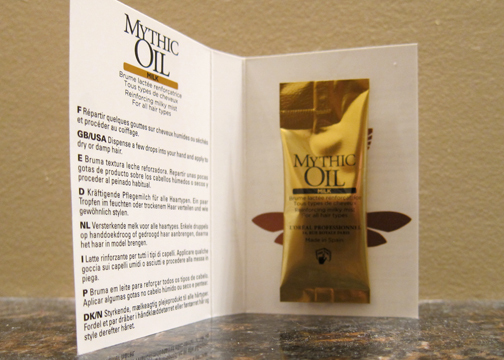 CHECK IT OUT: You can buy Mythic Oil as a shampoo, conditioner and hair masque, as well as the Nourishing Oil.